Courtesy Parkview Health Teachers at Wabash City Schools began the academic year with an active shooter emergency response training at Wabash High School. The exercise included props, such as manikins, and cooperation from Parkview Health Advanced Medical Simulation Lab, the Wabash Fire Department and local law enforcement agencies. School shootings across the nation – some of them fatal – have shaken students, staff, parents and communities. The tragedies have led to protests, asking lawmakers to enact tougher gun control laws. Reporter Ashley Sloboda and a team of other Journal Gazette reporters take an in-depth look at the violence, steps schools have taken to be better prepared to respond, and other issues related to safety. Coming Tuesday: Security isn't just an issue during school hours. How are districts providing protection during extracurricular events? On the day teachers returned for the new academic year, Jeff Galley watched as staff – in a training exercise – reacted to a simulated gunman in Wabash High School. The assistant principal was curious. At what point does that happen? Active shooter response training is one way Wabash City Schools is preparing for the unthinkable. “You hate to wake up in the morning wondering if today's the day,” Galley said. Wabash and other districts also teach strategies to use in violent situations, including ADD – avoid, deny, defend – and ALICE – alert, lockdown, inform, counter, evacuate. Empowering students and staff is the goal because the reality is typical authority figures, such as principals, likely won't be nearby when danger is imminent, school officials said. “The unfortunate reality of the situation is those students may have to make a very difficult decision,” Galley said. The Educator's School Safety Network agrees classroom teachers and support staff are the most likely responders in school crisis situations. Schools can invest in numerous products designed to make the learning environment safer – including metal detectors, computerized sign-in systems, bulletproof whiteboards – but the safety network says enough with the stuff. “Every dollar that is spent on a single-use gadget or gizmo is one less dollar spent on training that will save lives,” the nonprofit said in a recent report about violent threats and incidents in schools during the 2017-18 academic year. In the days after the nonfatal shooting at Noblesville West Middle School in May, district leaders credited safety procedures and regular practice for an incident that could have ended worse. “Our initial review of the incident shows that staff and students responded as they have been trained to do,” district spokeswoman Marnie Cooke told The Journal Gazette. More than ever, public schools have written plans for responding to shootings. The National Center for Education Statistics reports 92.4 percent of schools had such documents in 2015-16, up from 78.5 percent in 2003-04. Most public schools also have written plans for evacuations (91.5 percent), lockdowns (94.6 percent), and post-crisis reunification of students with their families (86.3 percent), according to 2015-16 education statistics. Indiana schools are required to conduct a tornado drill and a man-made occurrence disaster drill per semester along with monthly fire drills. In April, Bellmont High School partnered with Lutheran Hospital trauma services to teach bleeding control techniques to teens. Two months earlier, a gunman killed 17 at a Florida high school. Organizers noted the skills are also valuable in the event of car crashes, workplace accidents, industrial accidents and natural disasters. Since the training, Lutheran has begun scheduling them at churches and other high schools, said Michelle Stimpson, trauma injury prevention coordinator. “The trainings themselves are not to the scale Bellmont was, but that is always an option if that best fits the needs of those requesting the training,” she said in an email. In Wabash, high school teachers were invited to participate in the active shooter training. They could also watch from designated areas or leave the building, Galley said, noting teachers from other buildings were invited to observe. 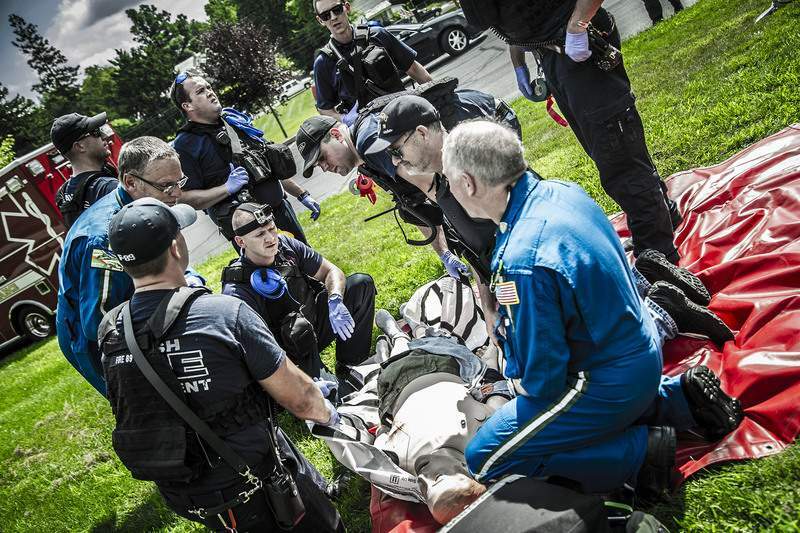 The exercise – which included participation from the Parkview Health Advanced Medical Simulation Lab, fire and police agencies – sought realism. Wounds were created with makeup; a manikin portrayed a police officer suffering from a head wound; another lay in a stairwell with a broken leg; and a sheriff's deputy played the active shooter role, complete with firing blank rounds. Rebecca Jensen, who manages the simulation lab, said her heart was pounding during the training. Striving for authenticity is important because the exposure should help people react in real situations, Jensen said. Even knowing what gunshots sound like indoors is beneficial, she said, noting she underestimated the volume. Debriefing continued weeks after the exercise, which highlighted areas for improvement, including communication, Galley said. About half the teachers participated, he said.